rental, transfers and domestic flights, excursions and complete packages, travel assistance, all Cuba is here ... for you. Holguín province has an area of 9300 square kilometers and a population of a little over a million. Most of the people live in urban areas. Its capital, which is also called 'the city of parks', was founded in 1720 and has a strong Hispanic influence. The right-angle grid of its streets was an innovation in its time and made it possible for Maceo and Libertad Streets, two of the main thoroughfares, to link a large number of parks and public squares, which have been kept just the way they have always looked. It is a city with a busy cultural life, made famous by two very different popular figures: 'El Guayabero' and the burro of Mayabe. 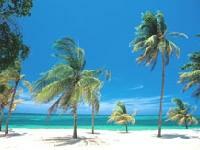 In over 40 kilometers the northern coastline of Holguín has 41 beaches. Guardalavaca and Esmeralda Beaches are the most popular ones among foreign tourists. Pesquero Beach has scores of fascinating natural sites, both under and above water; Don Lino Beach combines open areas, architecture and the natural surroundings; and Blanca Beach is very close to Bariay Cay, where Admiral Christopher Columbus first set foot on Cuban soil, during his first voyage to the New World ('the most beautiful land that human eyes have ever seen'). Saetía Cay is northeast of Holguín. This natural spot has 12 virgin beaches. On the other side of the city, to the southwest, La Mensura National Park, in Pinares de Mayarí, has tropical mountain vegetation and thick pine woods, which contrast impressively. Banes, the archaeological capital of Cuba; Gibara, also known as the Villa Blanca (White Settlement); and the capital of the province, also called Holguín, are the main towns and cities in this region, which is still just as enchanting as when Columbus stumbled upon it over 500 years ago and described it as 'the most beautiful land that human eyes have ever seen'. The May Festival, which is held every year on May 3 and 4, is a clear expression of the strong Hispanic influence which remains in Holguín. This festival, which is one of the province's most-deeply-rooted traditions, consists of a pilgrimage to the Loma de la Cruz (Hill of the Cross) which winds up with lively festivities and the raising of a flag that bears the symbol of the city: the Holguín ax. Official prices in USD. Prices in EUR only as reference using today's rate. Rate changes everyday.